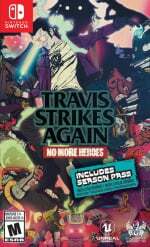 Travis Strikes Again: No More Heroes launches today on Nintendo Switch, and Nintendo UK has shared a brand new launch trailer to celebrate (see above). If you've already watched it, don't go away just yet, because Grasshopper Manufacture also has a couple of final announcements for its latest project, adding to the somewhat last minute reveal of its collaboration with The Legend of Zelda: Majora's Mask. The first of these announcements comes in the form of a new stage called 'Serious Moonlight'. The stage is based on Shadow of the Damned, a PS3/Xbox 360 title directed by Suda51 and released by Grasshopper back in 2011, and serves as one of the games playable on the in-game Death Drive Mk II games console. The second announcement speaks of a 'Day 7 Patch' which, unsurprisingly, is set to be pushed to the game seven days after release. The patch will add a brand new opening movie to the game, although the movie's contents haven't been revealed. If you're considering picking up a copy of Travis Strikes Again: No More Heroes for yourself today, make sure to give our full review a read. Will you be buying this one today? Are you already playing it as we speak? Tell us below. My copy arrived this morning so gave it a bit of a play. Pretty fun so far. Haven't played a ton yet because I need to juggle this and Tales of Vesperia. Man I loved SOTD. Any game where a boss fight involves a homicidal killer you can hear in your proximity due to accidentally swallowing an accordion is gold. Can't wait to pick up TSA when funds allow! I never did get to play No More Heroes despite usually loving anything Suda51 releases but man this game just looks really bad.I'll need a demo for this for sure..
@chiptoon yeah, it would be weird to wait 7 days for a patch to purchase it. Seems odd. @JaxonH It's strange that it didn't make it in the initial release but if you need to leave something out, might as well be the most irrelevant part. I just played an hour of it. It's a good game so far. Plenty of fast paced action. Hoping it's successful enough to warrant NMH3. Huh, I wonder why they have to patch in an opening movie. That's... no that isn't even unusual, I have never heard of that. Some kind of weird licensing issue maybe? I can’t wait to okay this, but Resi 2 is out next week and this early in 2019 it’s a contender for GOTY. The demo was incredible. Amazon says it’s on its way and I’m planning on playing it co-op with my housemate. Unfortunately we’re moving next week so there’s simply no time until we’re all settled in to our new place. At least we’ll get to see the opening movie. @JaxonH @nate83km @chiptoon I feel like the Day 7 patch thing is a protest of the Day 1 patch. Sure it’s odd to have to wait that long for content, but it is Suda 51 we are talking about here - he probably thinks it’s hilarious! I really love this game! Played for several hours now. Think it's time to quit comparing this to No more heroes and play it as it is. Day 7 / Killer 7? @Rodan2000 Best theory I've heard so far. Noice! Excited to dive into this on my days off. Still trying to figure out why people think this looks so bad. I really hope we get NMH3, or at least a release of the first two games on Switch. I'm in the middle of the second chapter and it's really good so far. It's getting a good reception from the early adopters, I think I might have to pick it up. Nowhere local has it physical, I'll wait till next Friday and if the situation is the same I will just dl it. Superfun game - don`t listen to negative reviewers !!! Random observation: The music in this game is so good that I stop what I am doing just to listen to it. That is typical for Suda 51 games however, so I was not surprised! I'm curious as to what they're adding? The current intro is short, but doesn't require much further explanation. Somewhat related, but the current intro really made me want to play Hotline Miami again once I heard the music thumping. @NintendoFan4Lyf Less a protest than a straight up gag, I'm guessing. I mean, the game already has an opening movie, it's not like you press start and get a "opening movie to be inserted here" message, though that would be pretty funny. Nah, I think this is gonna be something silly poking fun at the idea of day one patches, but I guess we'll find out on day seven. @solcross Yeah, Hotline Miami has an incredible soundtrack. We don't often think of music as necessarily being integral to gaming, but that soundtrack is a huge part of why I love that game so much. @premko1 I agree 100%, it's a blast and I'm not sure what people are looking for with this one...whatever, their loss!